Many of Roy Williams' current beliefs were developed in his early days of coaching high school basketball in North Carolina. 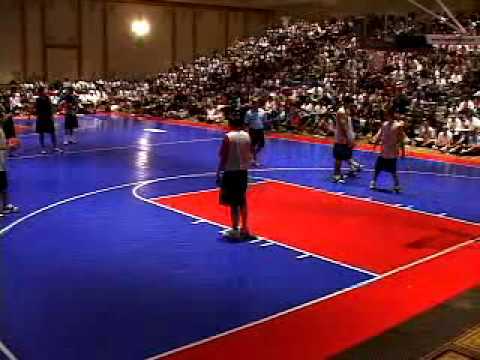 This basketball video will illustrate the "Tar Heel Running Game" with the use of players in an impressive on-court demonstration. This style relies on running the floor and sharing the ball with teammates. Advantages of this style are that the running game negates the defense's ability to get set, which leads to many easy baskets. Coach Williams covers his three offensive rules against a set defense, the importance of reading the defense and the importance of getting the ball out of the net and inbounds quickly. To work all facets of the primary break, Williams includes many drills that help offensive advantage situations, communication, finishing, down court passes by post players, quick inbounds pass and more. Once the primary break ends, the secondary offense begins. Multiple options are built into this attacking scheme. Ball reversal, lob, back screen and post feed are all options in the secondary. To safeguard against a denied reversal, a screen away option and on ball screen option keep the offense flowing. Williams uses 5-on-5 play to point out important teaching points. No college team runs the fast break as well as Coach Williams' Tar Heels. This instructional video has drills that can be applied to any team and can help your team run and score "all night." Roy Williams: Tar Heel Offense & Transition Drills 5.00 out of 5 based on 0 ratings. 3 user reviews.